How To Distinguish Different Quality Sublimation Transfer Paper -Fei Yue Digital Inc. The highest and best quality garments with prefect sweat wicking properties is available at reputed e stores, making it possible for anyone looking for high fashion apparel like sublimation clothing, to get it sitting right at home. You can make a mark by wearing this long lasting yet fashionable clothing too . In order to determine whether you can imprint a product with a wash-fast, scratch-resistant, full-color sublimation image, you'll need to check three items: First, is the decoration area polyester-based? Sublimation printing is reliant on polyester's unique molecular structure (e.g. its ability to bond with the gassed ink dyes). You can not sublimate to cotton, nylon, vinyl, wool, leather, etc. Well, sublimation is a great professional way to personalize shirts, coasters, puzzles, mouse pads and more. It is similar to heat transfer, however it is a process where the image becomes an actual part of the item. Sublimation uses special paper, ink and polyester-coated items that all react with each other. Transfer rate. Good transfer rate can make the transferred substrate more beautiful and save more ink. Ink compatibility. Good sublimation transfer paper is required to adapt to all kinds of ink as soon as possible. The speed of drying. High speed drying make printing become more and more convenient for users, and it is helpful for improving the speed of delivery. The warp degree and time of war page. In the condition of dry and high temperature, the stretch rate of coating layer and the base paper are not same, this will cause the single side become warped, then influence the following operation. Wrinkled when printing. It’s required that the sublimation paper can’t pucker too heavy when printing, or the paper may rub the print head, and influence the lifetime of print head. Impurities on the Paper. Impurities on the paper is an important indicator of judging the sublimation paper. Impurities have a bad influence on pure color printing. 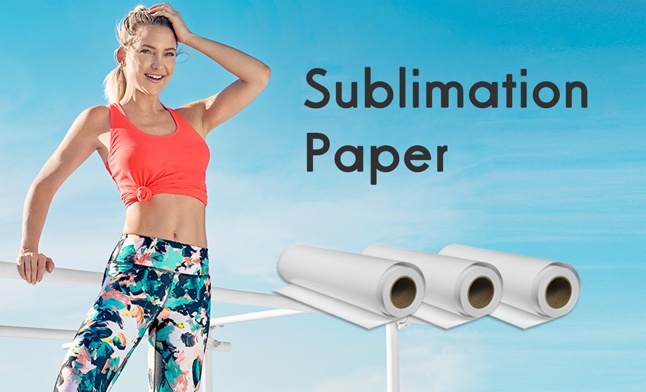 Stability of sublimation paper. The quality of sublimation must be stable, or the sample you provide to customers will be hard to reappear.